Summer is nearly here. Hooray! And heading off to Catalonia for a much needed break would be a great choice. You may know the beautiful city of Barcelona is Catalonia´s capital and as the tourists flock for tireless sightseeing, perhaps venturing out to see what else the region has to offer could be a bit more relaxing! Catalonia is on Spain´s eastern coast and where does that end? That’s right, the Mediterranean sea! If you´re looking for family fun or a playful trip with friends Port Aventura theme park situated in Vila-Seca in the Catalan province of Tarragona could be for you. It opened in 1995 as the first theme park in Spain. The park has six different areas, five of which are themed as different regions of the world; the Far East, China, Mexico, the Mediterranean and the tropical paradise of Polynesia. The newest addition is a Sesame Street themed area. There are huge rollercoasters, children friendly rides, restaurants and shows. You can make your visit easy by staying in one of the many hotels in Port Aventura, that way, the park is on your doorstep. 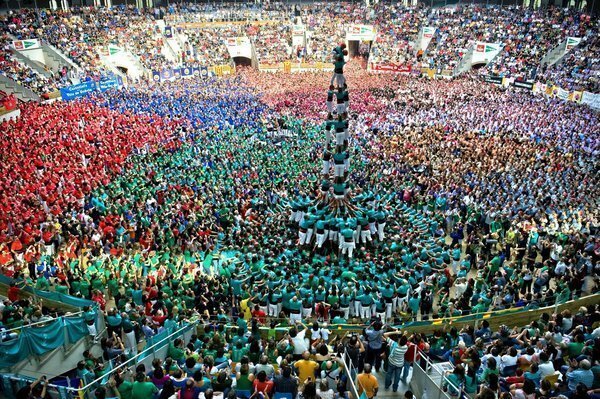 Tarragona is also known for its incredible Festival of the HumanTowers usually held in October. Castels as they are known in Catalonia, have the heaviest men providing support at the base of the tower and the lightest clambering up past their colleagues, who make up layers of a tower all the way to the topmost level. See this incredible competition in the Bullring in Tarragona - it's amazing to watch the strength and agility of the men and women brave enough to take part. Many teams are involved, wearing bright colours to identify them to the audience and a team can be up to 500 strong. The event is at least 200 years old and is of great importance in the cultural life of the town. If you only want to spend a day or two at the theme park you could make it part of a longer stay in the region. Port Aventura is situated in the beautiful coastal resort of Costa Dorada. Stay in a hotel in Costa Dorada and enjoy its 20 municipalities across its coastline of 216km. It is the perfect place for your well deserved rest. Each day you can choose between one of the coastal towns such as Salou, Cambrils and Ametlla de Mar and relax by the white sandy beaches. Salou, one of the best known resorts, is the place to be for water sports, restaurants and nightlife. Cambrils has the charm of a quaint fishing village with cobbled streets and traditional tapas bars. If you want to explore further inland then the towns of Reus, Valls and Montblanc may take your fancy. Rues is a historic town with beautiful squares and interesting museums. Whereas Montblanc, still caged by its ancient town walls, is wonderfully preserved with medieval churches and gothic buildings. Catalonia has so much offer - the beaches are beautiful, the towns and villages are packed with interesting sites and events and of course, the weather beats most places - it's a perfect holiday destination.